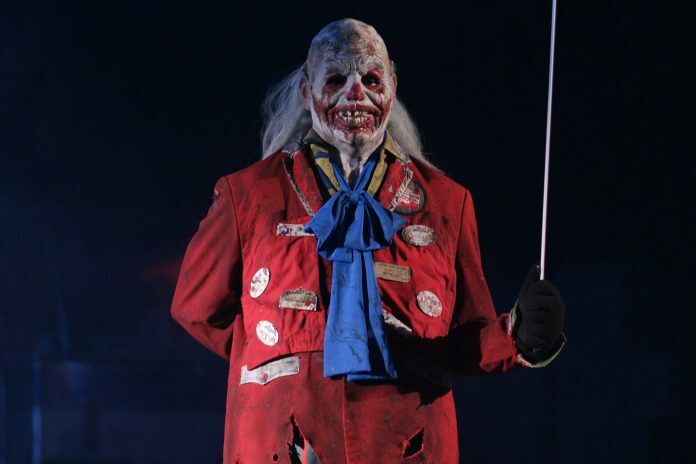 Halloween Horror Nights has officially begun at Universal Studios Hollywood. 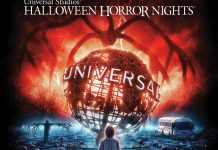 Boasting a lineup featuring both classic and new horror properties alike, this year’s event comes close to matching the widely-acclaimed Halloween Horror Nights 2016 in both its execution and energy. 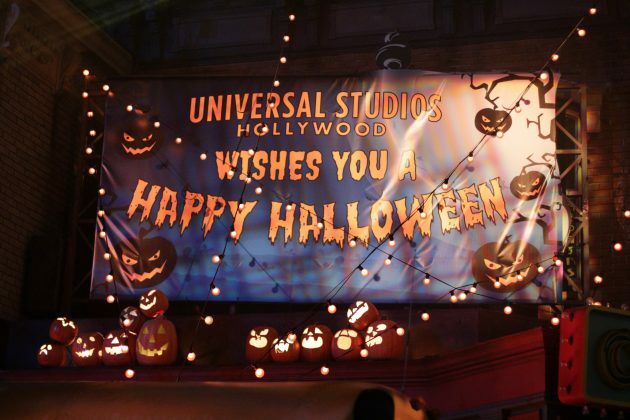 Last year’s event was given the difficult task of following one of the strongest years in Hollywood’s Halloween Horror Nights history; unfortunately, the quality of the event was unable to compete. However, sporting a high budget and some strong properties, this year’s event was given the upper hand from its very conception, and we are glad to say that it does not disappoint. 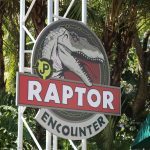 After being graciously invited by Universal to attend opening night, as well as making multiple return visits, we’ll take a look at and give a brief review of the mazes, scare zones, and show featured at this year’s event. There may be spoilers ahead. 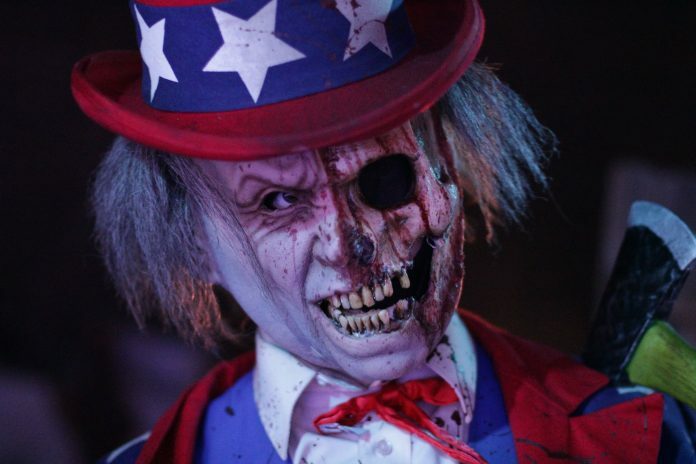 This year’s Halloween Horror Nights features 8 mazes (including The Walking Dead Attraction) alongside the Terror Tram, with four walk-throughs in the Upper Lot, two in the Lower Lot, and three in the metropolitan sets of the Universal backlot. 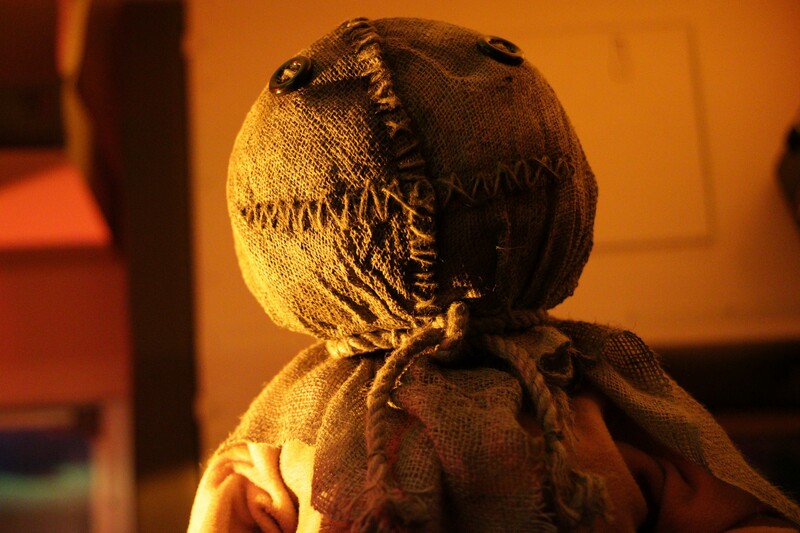 You can’t kill the boogeyman. This proves especially true in Michael Myers’s return to Halloween Horror Nights after a brief break from the event. Based on the fourth installment of the “Halloween” franchise, the maze follows Michael Myers in his escape from a mental hospital as he wreaks havoc on the small town of Haddonfield and all of those who inhabit it. 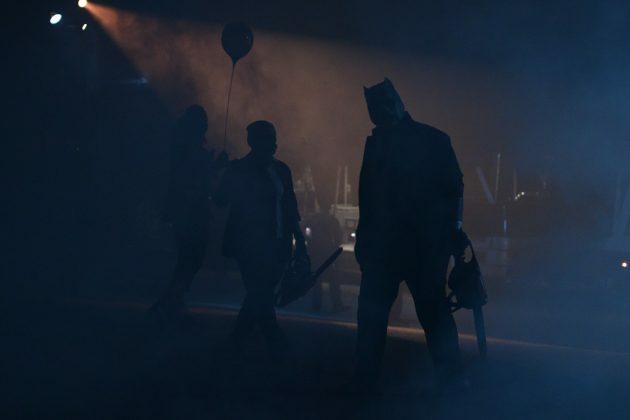 This year marks the third time Michael Myers has appeared at the event within the past four years. 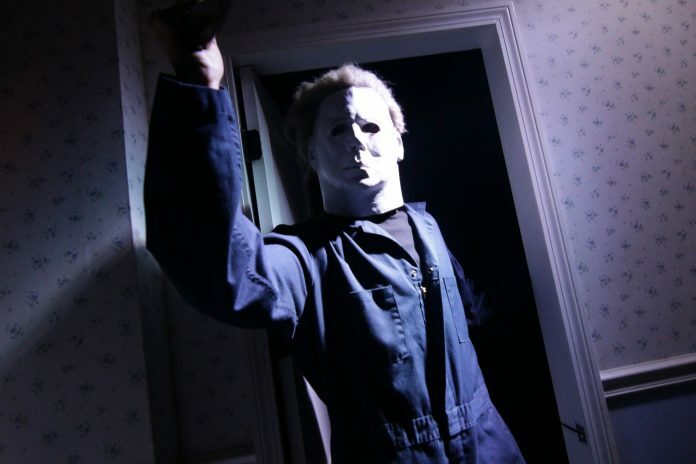 However, his return was still welcomed as ever by fans whom vividly remember the previous two iterations of the Halloween franchise at Halloween Horror Nights – 2015’s Halloween: Michael Myers Comes Home, and 2016’s Halloween: Hell Comes to Haddonfield. 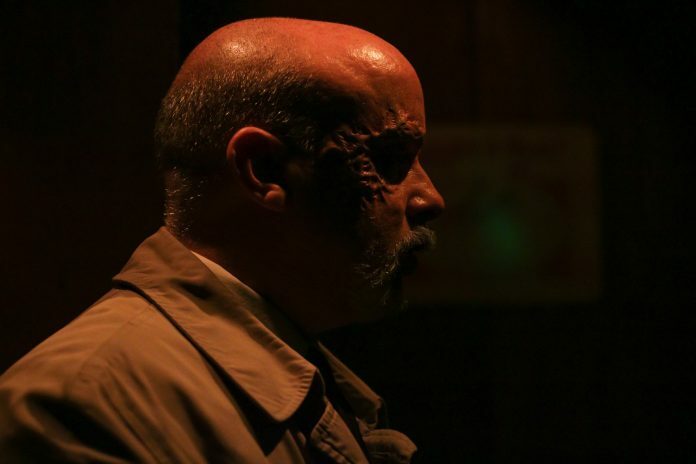 Each concluded with its own creative, original ending that won the adoration of both the general public and fans alike, leaving this year’s maze with quite a lot to follow. Unlike how Hell Comes to Haddonfield began exactly where its predecessor left off, the Halloween 4 movie itself takes place approximately ten years after the events of Halloween 2, and likewise, the maze follows suit. After learning of Michael Myers’s escape during a transfer to a new mental hospital, Dr. Loomis – Myers’s psychiatrist – immediately makes it his mission to pursue and stop Michael in Haddonfield before he has the chance to begin yet another killing spree. Following these same events, guests enter at the gas station that Loomis had followed Myers into in the film. Hardly avoiding an encounter with the boogeyman himself as they pass by an array of stray auto parts, they then find their way into a diner, where Loomis makes an appearance aiming a gun at and shooting a rapidly disappearing and reappearing Michael. 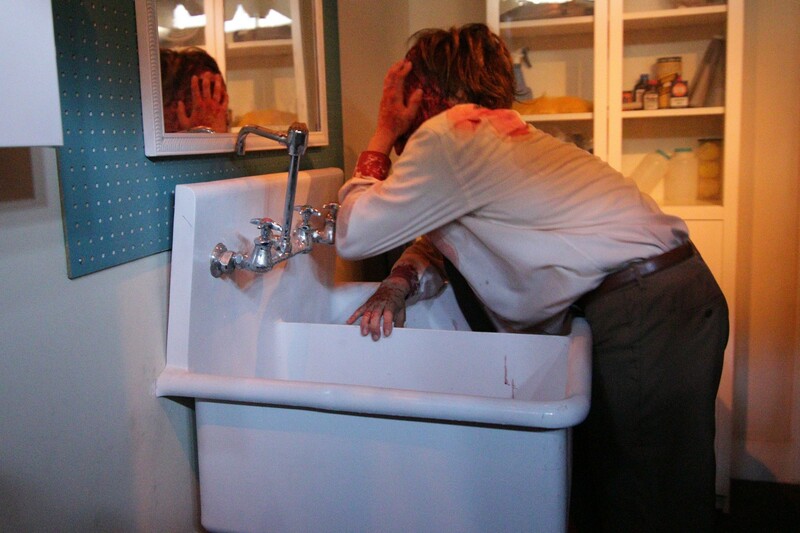 Though invincible as always, Myers perseveres, continuing to stalk and jump out at guests at each and every turn. Multiple locations, as well as characters and kills from the film, are featured in this maze. However, like the previous maze iterations of the Halloween series, the ending takes a turn away from that of its respective movie – literally, in this case. 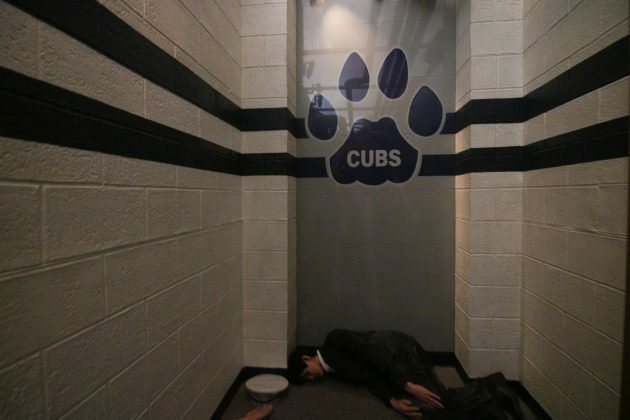 While scenically, the ending may be lacking, scares-wise, it is anything but. 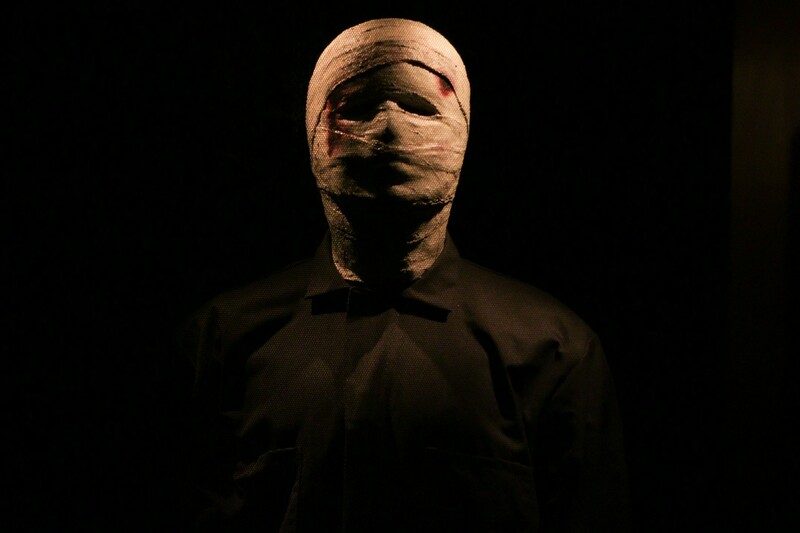 Myers is relentless in the finale, catching those who had believed the maze was already over, off-guard in black box scares multiple times before they can obtain a sense of sanctuary. While Halloween 4: The Return of Michael Myers may not be as visually strong as its predecessors, it succeeds in surpassing them in scare factor. 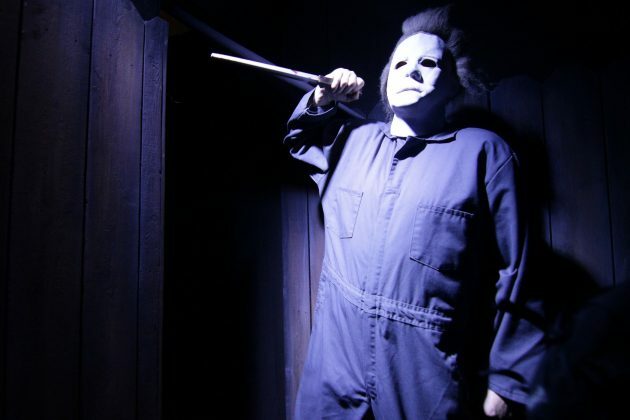 For those who are particularly light-hearted, be warned that Michael Myers will keep you on your toes throughout the entire maze. As for those who claim that they are not, you’ll still certainly have a vivid image of Myers’s iconic mask in your head for the rest of the evening. There is not much to say about The Walking Dead Attraction’s presence at this year’s event. 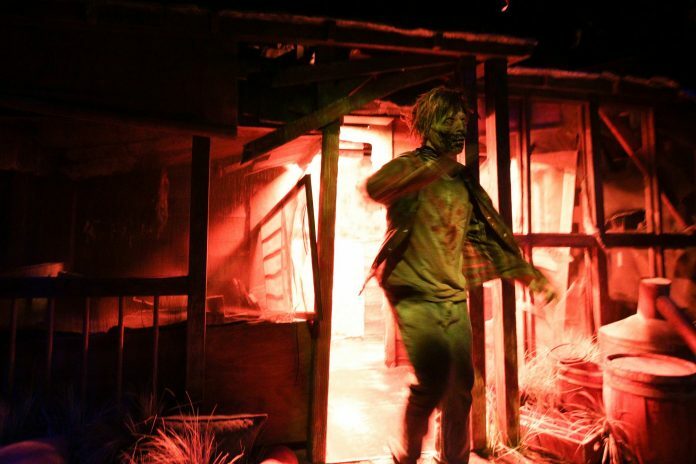 Similarly to its past two years at Halloween Horror Nights, the maze adds a few extra scare actors and scare locations that differentiate it from the daytime attraction. “We belong dead.” Such is the slogan of the Universal Monsters featured in this maze. Bringing together many of the classic icons of the horror genre – including but not limited to Frankenstein’s monster, the Invisible Man, the Wolf Man, Dracula, the Mummy, and the Phantom of the Opera – this maze takes a differing approach in execution from that of the House of Horrors, as long-time fans will note. 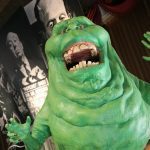 For those who may be unaware, the House of Horrors was a daytime haunt similar to that of The Walking Dead Attraction, where guests could make their way through the sets of Universal’s classic horror movies and meet the monsters that had initially brought the genre to life. 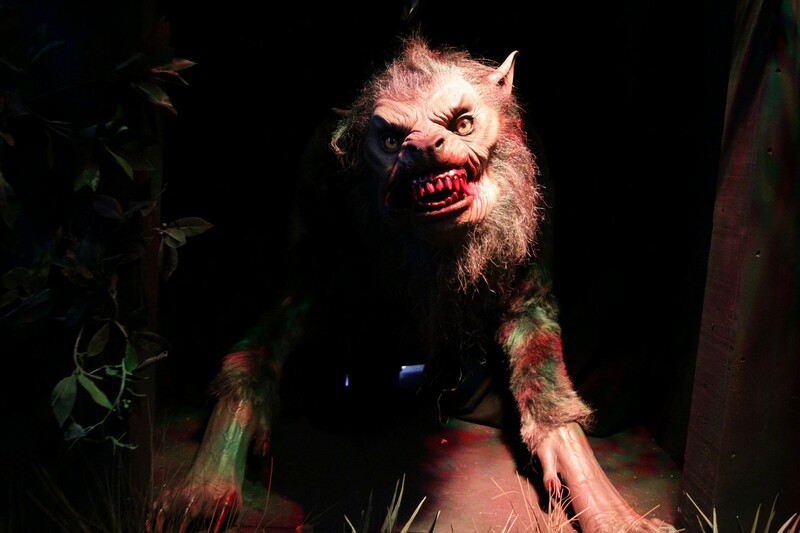 Similarly to the House of Horrors, this maze introduces many of the iconic and beloved Universal Monsters as guests walk through sets based off of the classic horror genre, though in a more modern take than its predecessor. 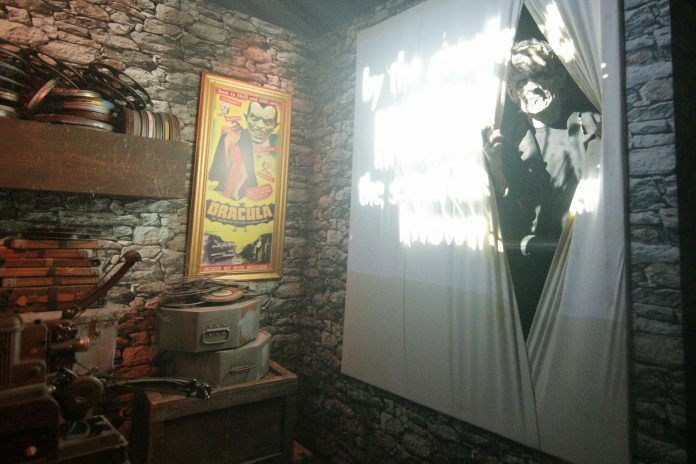 While the House of Horrors may have had size to its advantage, the Universal Monsters maze manages to portray the illusion of a much larger space than it truly occupies through its immersive elements and excellent storytelling. 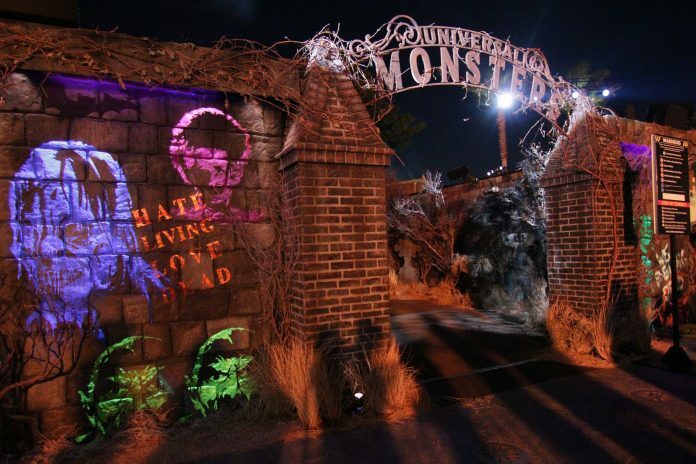 As guests approach the entrance to a graveyard, blacklight illuminates graffiti featuring a variety of designs based off of the aesthetic of, and including, the classic Universal Monsters themselves. 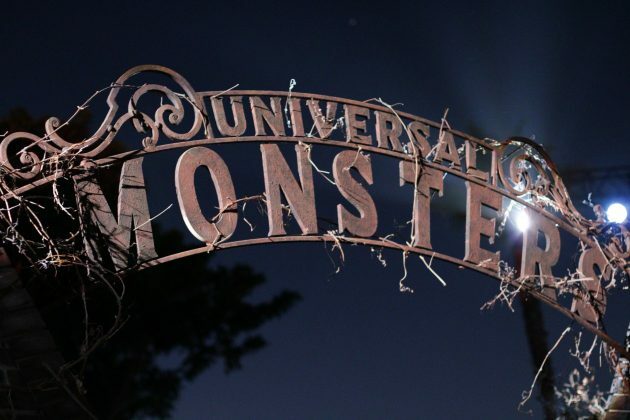 Slash’s ominous score echoes in the background throughout the queue in Universal Plaza, creating a mood of uneasiness before guests can even make their way through the aged iron arch reading “Universal Monsters”. Upon entering the seemingly abandoned graveyard, a strange energy comes to haunt the air, making it appear that something, or rather, someone, is watching them. Before heading into the Mausoleum located towards the back of the graveyard, guests are greeted by a very familiar icon of the horror genre. Each character featured in the maze sports a unique composition by Slash that adds extra flavor to the settings already rich with detail. The underlying melody of the score, however, becomes increasingly apparent to guests with a keen ear, helping to bridge together the many complex stories that make up the walk-through. It is evident that the love of a dedicated Universal Classic Monsters fan was put into this maze, giving it an energy like no other. Between the attention to detail, as well as multiple creative scares, Universal Monsters is, simply put, a very strong maze in all regards. Hollywood Harry returns in this year’s Terror Tram. For those who may be unaware, the fictional backstory of Harold Kappowitz – better known as Hollywood Harry – begins in the late 1950s, with Kappowitz’s initial alter ego, Koodles the Clown. As the friendly Koodles the Clown, he entertained children of all ages for many years in his Universal Studios television show. However, as clowns began to be portrayed as scary rather than silly, Kappowitz’s circus career crumbled. He then became the unofficial mascot of Universal Studios Hollywood until he was eventually forced to become an unpaid street performer instead. Though as the years went by, Kappowitz became increasingly violent and frequently lashed out on guests, leading to his permanent removal from the property. He immediately fled into the Hollywood Hills, giving him the new alter ego of Hollywood Harry until he disappeared, both in physical presence and in remembrance by the public. 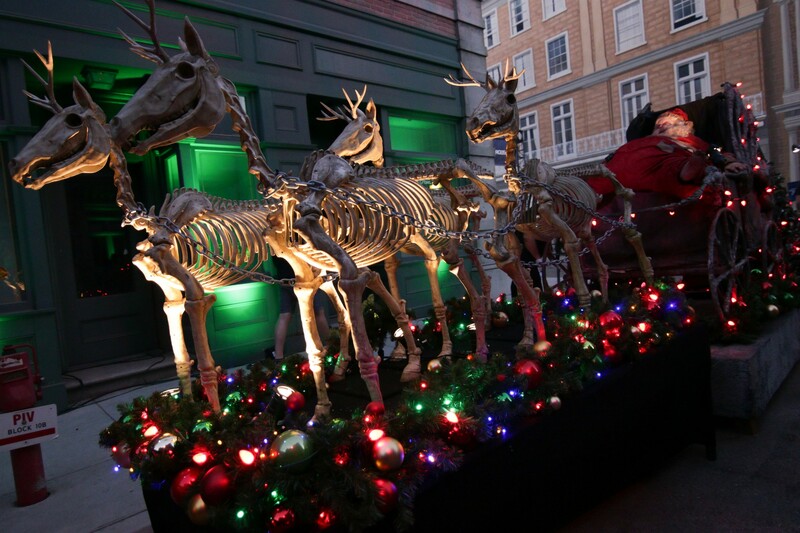 He suddenly came out from hiding in the summer of 2016 when he was spotted roaming the Universal backlot. During Halloween Horror Nights of that year, Hollywood Harry, joined by a troupe of manic clowns, chased guests all throughout the Terror Tram. 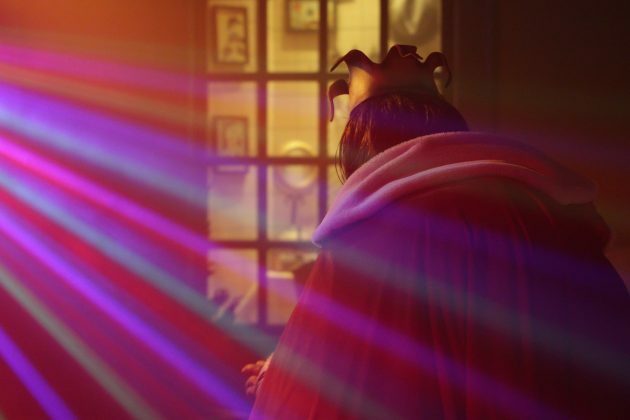 Although it had appeared that he was finally gone for good at the conclusion of the event, tour guides have begun to disappear once again, indicating his impending return. On this year’s Terror Tram, Hollywood Harry takes guests through his five of his twisted “dreadtime” stories, beginning with a pack of angry dogs with chainsaws, to the cannibalistic “Killbillyz Inn”, then through a field of undead scarecrows seeking revenge, to killer clowns roaming the site of a crashed plane, and concluding with Hollywood Harry’s very own torture factory. 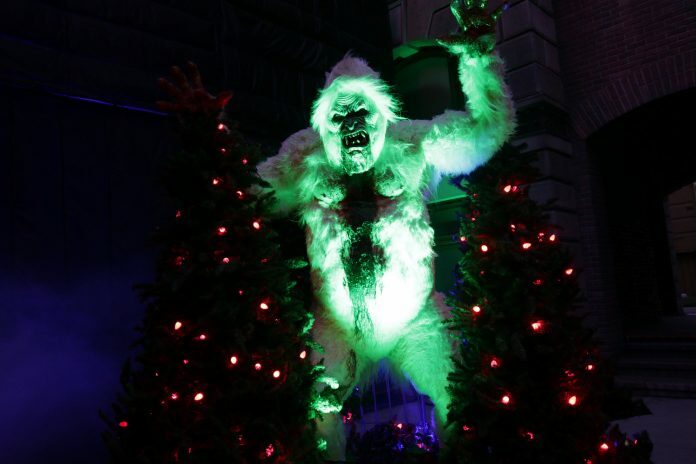 Overall, this year’s Terror Tram experience remains relatively the same to that of 2016’s, where Hollywood Harry made his first appearance at the event. 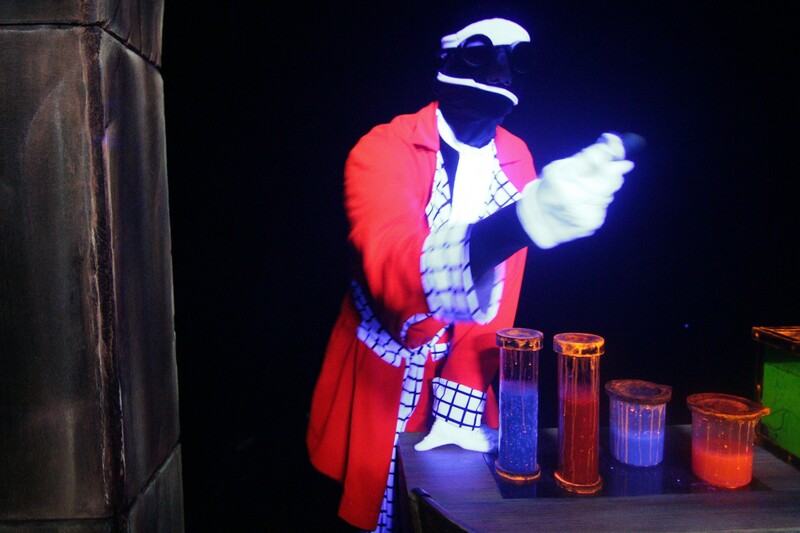 While the actors do try their best to make the walk-through as immersive as possible with their energetic spirit, there are many dull areas along the path that lack both theming and scares. One area that stands out, in particular, begins once guests head up the hill away from the Bates Motel, where much of the experience is spoiled by a switchback queue that forces them to wait in a massive crowd before entering the next “dreadtime” story. 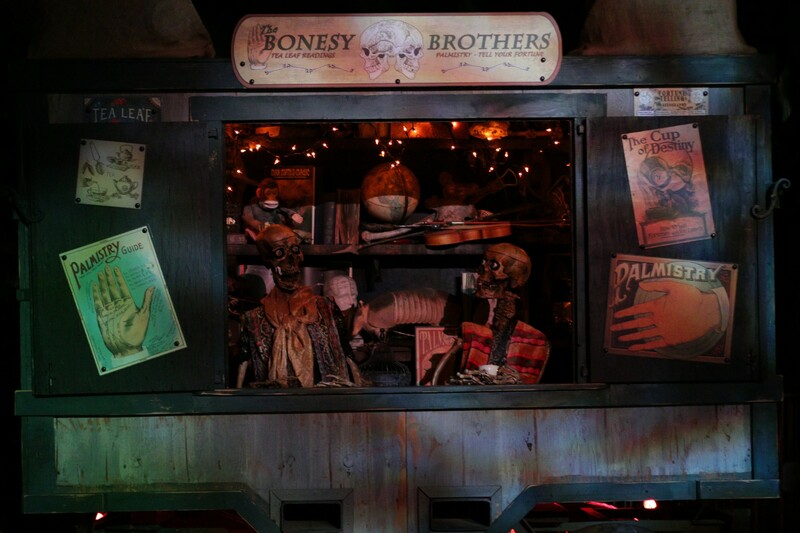 Although this year’s Terror Tram is good in concept, the concrete flaws of the walk-through itself prevent it from becoming a truly memorable and immersive experience. 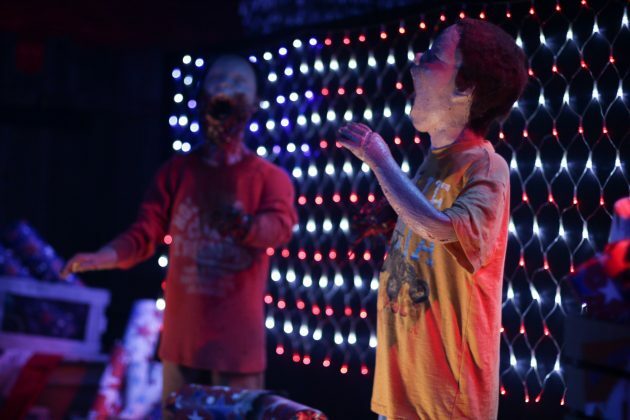 A mega-hit among fans of all ages and pop culture phenomenon, the appearance of Netflix’s Stranger Things at this year’s Halloween Horror Nights turned all previous expectations of the event Upside Down. 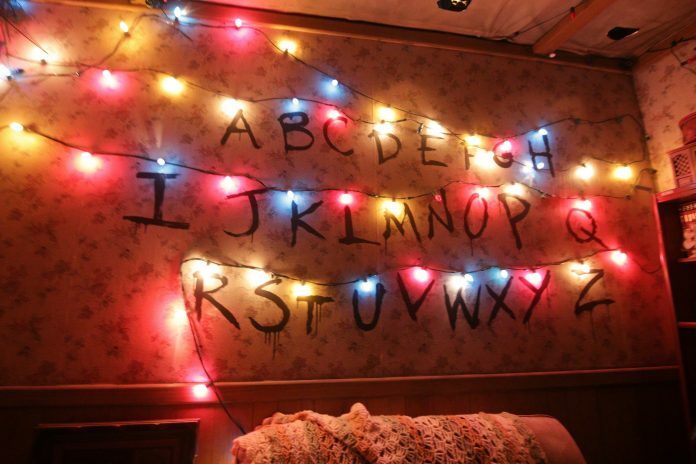 Following in the footsteps of The Walking Dead series, as well as American Horror Story, Stranger Things occupies a frequently-occurring spot in the lineup for very popular television shows. Halloween Horror Nights fans have spent months in fear of the inevitably massive crowds bound to flock to the event for the presence of Stranger Things alone. Given this overwhelming anticipation, both fans’ and the general public’s expectations for the quality of the maze far surpassed those for any other, leaving creative director John Murdy with big shoes to fill. For those who have not watched the show, it takes place in Hawkins, Indiana, during the 1980s, and surrounds a group of kids determined to solve the mystery of the paranormal events occurring in their town in the attempt to find their missing friend, Will. As stated earlier in our behind-the-scenes preview of Stranger Things, the maze follows Will’s journey just as the first season of the Netflix show does. 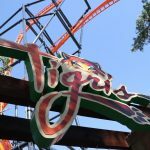 Classic songs from the 1980’s featured in the show, including The Police’s “Every Breath You Take”, and of course, The Clash’s “Should I Stay or Should I Go”, blast through the queue as guests approach the entrance to the maze, helping to create the 1980’s vibe that the show so-accurately achieves. Upon entering the maze, you find yourself in a forest just outside of the Hawkins National Laboratory, as indicated by a sign on the barbed-wire fence just before you. Will’s bike lays stashed on the ground just behind the fence, lights flickering upon its spinning front wheel as his friends’ voices echo in the near distance over walkie-talkies. 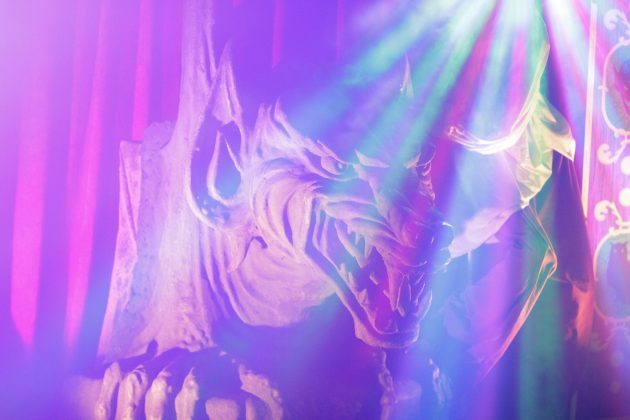 You soon sense the presence of something not of this realm, and all suspicions are confirmed as you discover hints that the show’s main antagonist – the Demogorgon – is looming in the background, hunting you as its prey. With expectations raised so high for this maze, it is difficult to give it an unbiased review. Stranger Things is undoubtedly packed with detail and immersive sets giving off the illusion that you are walking through the actual filming locations of the show. 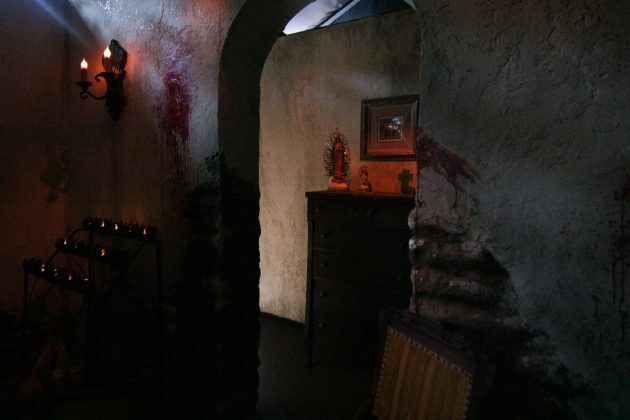 Detail-oriented fans will note that aspects of the setting as small as the wallpaper pattern in Will’s room to the eerie rattle of the Demogorgon have been pulled straight from the show itself, adding an additional sense of authenticity to this maze. 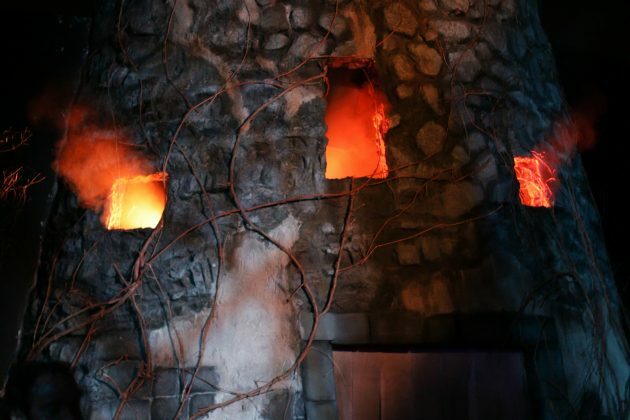 Both die-hard fans and oblivious guests alike will find something of interest in this maze, though those looking to be scared out of this world may find themselves a little disappointed, as it is light on scares. 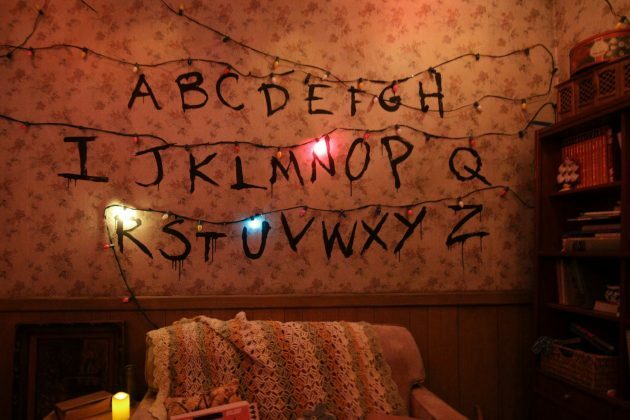 Regardless, Stranger Things certainly makes for an impressive maze with its level of immersion, bringing guests straight into the realm of the Upside Down. 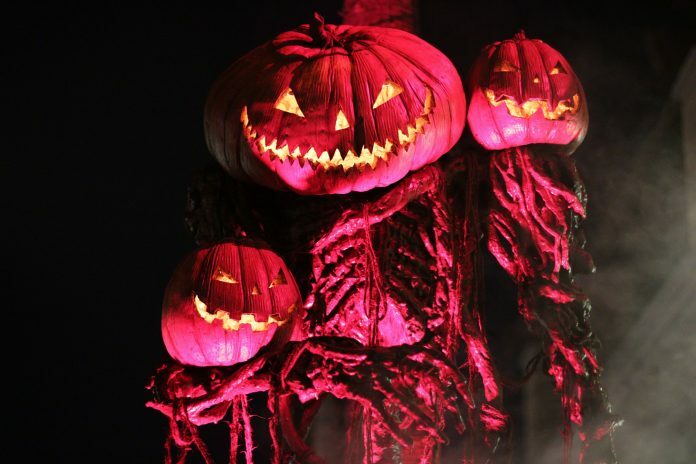 After many years of fans begging for the horror-comedy, cult classic film to be brought to life at the event, Trick r’ Treat has, at last, arrived at this year’s Halloween Horror Nights. 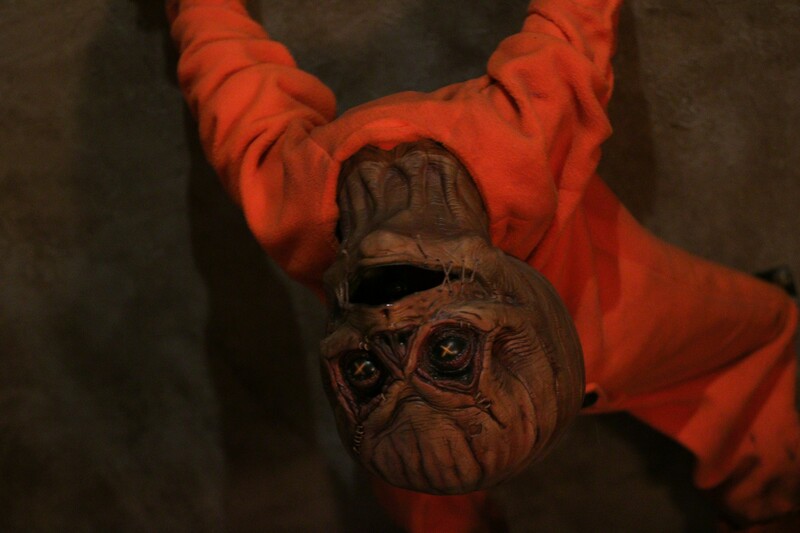 Just as the movie does, the Trick r’ Treat maze follows four different Halloween-inspired stories in a nonlinear order. 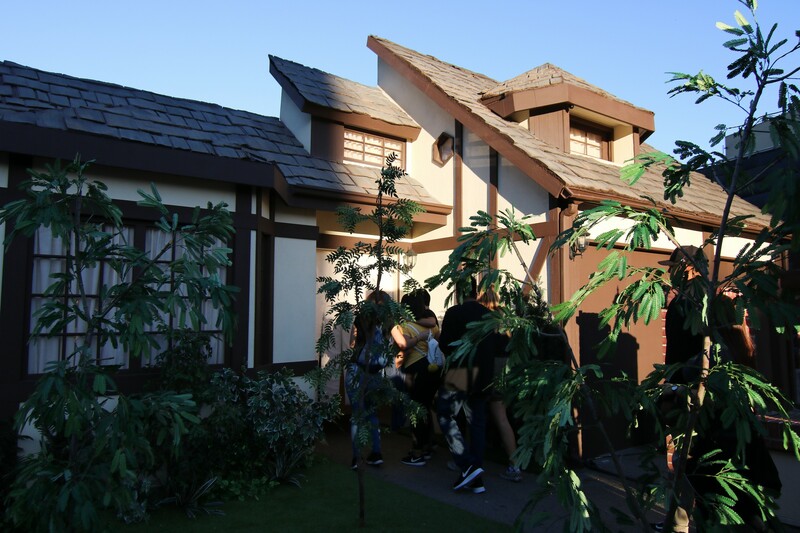 Guests approach a facade of Henry and Emma’s house from the prologue of the film as they enter the maze, hearing Emma’s negative remarks about the holiday of Halloween play in the background just before getting a glimpse at her harsh consequences. 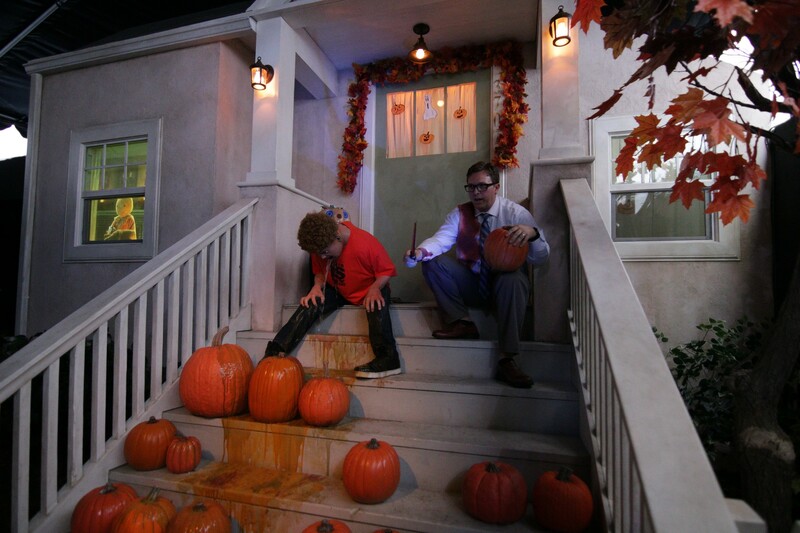 Sam – a Trick r’ Treater with a jack-o-lantern head determined to enforce the “rules of Halloween” – soon makes his first appearance, serving as the constant that ties Trick r’ Treat’s anthology-like plot together through his hidden appearances in each individual story. Each section of the maze, showcasing the different chapters of the plot, is distinguished by a title card reading its identical name from the movie. Whether guests have seen the film or not, they will still undoubtedly feel as though they have been transported into the seemingly-average Halloween night in the town of Warren Valley, Ohio, where the events of the movie all take place. Although the maze does utilize a number of empty hallways with simple black box scares at each corner, these transitions located just after each story’s title card still manage to flow, catching guests off-guard before they can make their way into each new show scene. 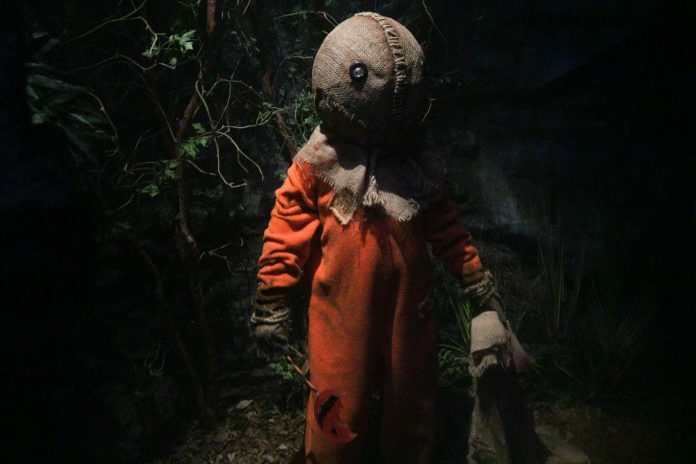 In addition, the show scenes themselves are rather large and impressive, creating a layer of immersion for all guests, including those who entered the maze with no knowledge of the movie or any idea of what experience Trick r’ Treat would offer. While Trick r’ Treat may not be widely spoken about at this year’s event, the maze certainly provides guests with an equal amount of scares and scenery in its traditional Halloween feel, creating a fun yet memorable experience for all. 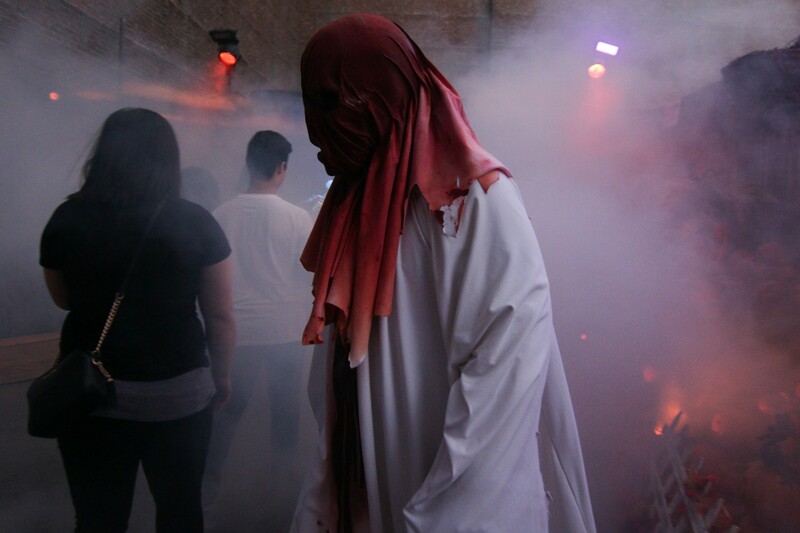 Initially, the announcement that the Horrors of Blumhouse maze from last year’s event would be coming back for this year’s event was not well-received by fans and the general public alike. However, although the two staple properties announced for the maze were Blumhouse’s Truth or Dare and Unfriended, one small surprise was slipped in to the announcement – the maze would conclude with a third original section named, “The Girl”, inspired by the little girl in the old house featured in the opening title sequence before all Blumhouse films. 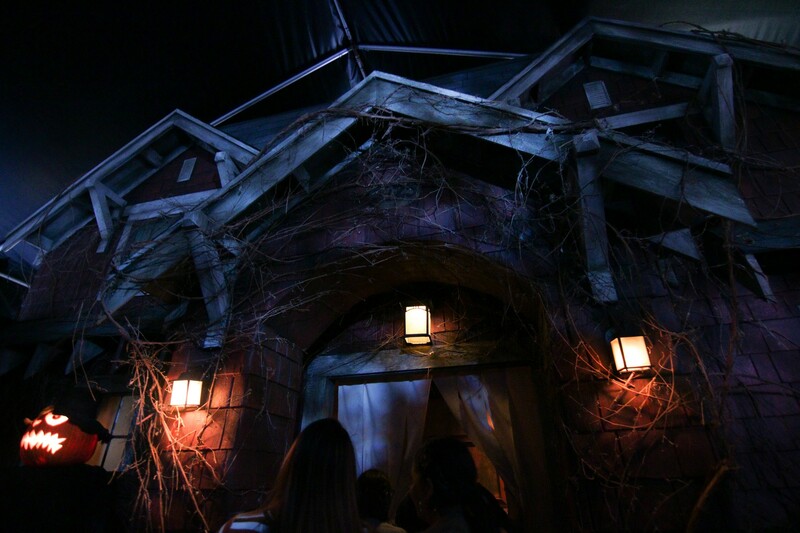 While Hollywood’s Halloween Horror Nights event does occasionally take their own original twists away from the intellectual properties their mazes are primarily based on, dedicating an entire section of the Horrors of Blumhouse: Chapter 2 to a creative, unique story adds an extra level of flavor that not only compliments the other properties in the maze, but also allows it to conclude on a high note. 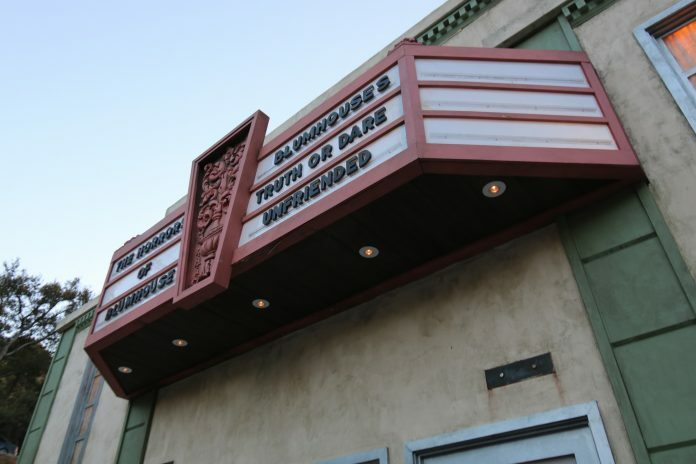 Guests enter a facade of a movie theater nearly identical to the one featured in the first iteration of the Horrors of Blumhouse, though this time, however, it is decked with posters of the films represented just inside, including an original poster based off of the maze’s take on “The Girl”. 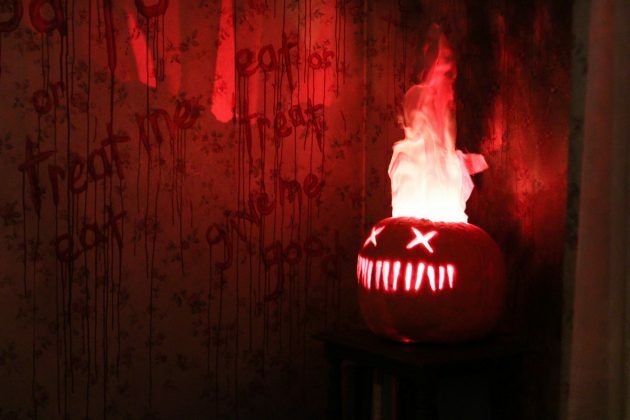 Similarly to Trick r’ Treat, title cards indicate the transition into each new section of the maze, beginning with Truth or Dare, followed by Unfriended, and concluding with The Girl. 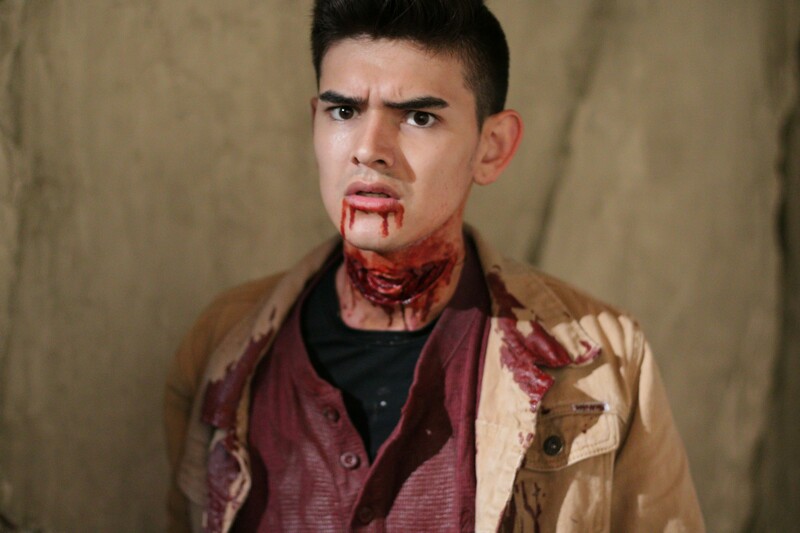 The Truth or Dare segment of the maze takes place in the cursed, abandoned church where an ancient curse forces a group of college students to become involved in an endless, deadly game of truth or dare. 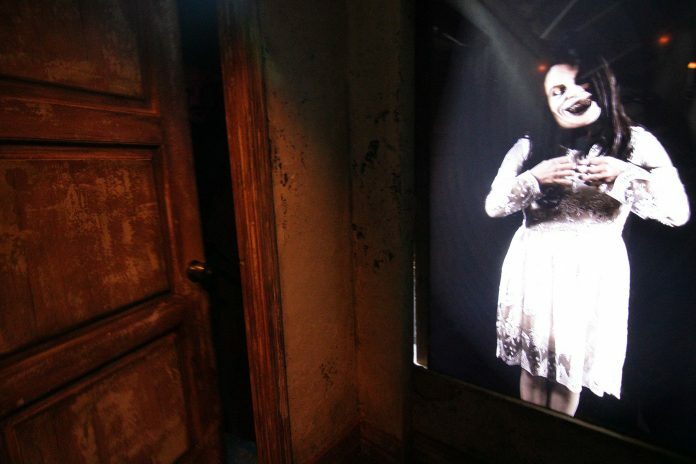 Surpassing all expectations, Truth or Dare features a surprisingly immersive environment loaded with detail, as well as multiple creative scares and kills from the movie. The Unfriended section is not quite as detailed, though it does also feature some of the brutal scenes and familiar characters from the film through a mixture of screen projections and live actors. The Girl concludes the maze, luring guests into the old, creepy house where a little girl calmly walks around. 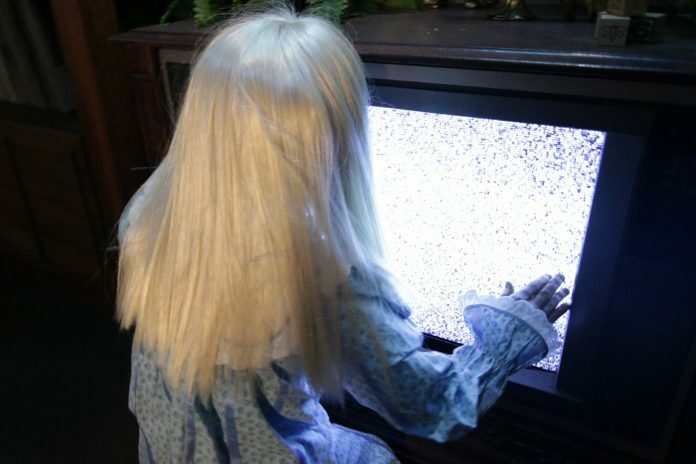 The appearance of a demon in the background, alongside the twisting and turning picture frames on the wall, captures the audience’s attention, indicating that the little girl in the room is anything but ordinary. The Horrors of Blumhouse: Chapter 2 succeeds in holding up as a maze. While the featured properties may have initially appeared to not have much to offer, the combination of Truth or Dare, Unfriended, and The Girl offers a maze packed with scares and an additional layer of creativity that distinguishes it, against all expectations. Returning for its sixth consecutive year at the event, The First Purge explains how the infamous annual Purge came to be through the franchise’s first maze appearance at Halloween Horror Nights. 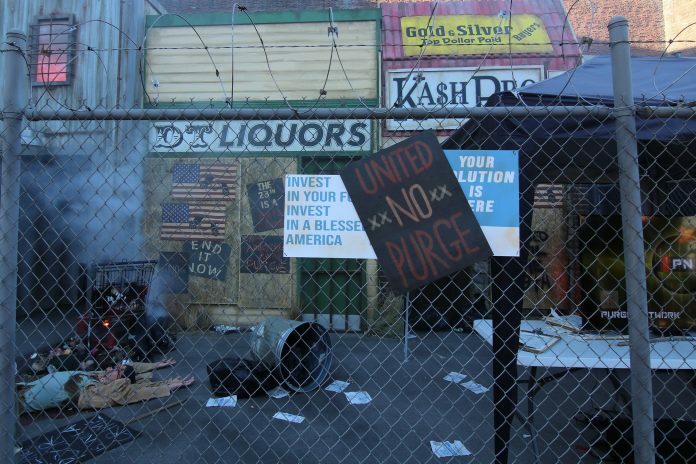 The facade engulfs guests with its miscellaneous storefronts vandalized by both participants and protesters of the NFFA’s psychological experiment. 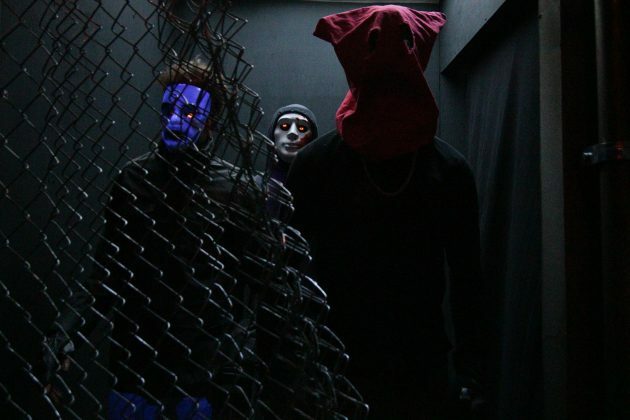 Just before heading inside of the barbed wire fence, they encounter a Purge psychologist who tests their knowledge on all things related to The First Purge. Continuing the popular trend of the past few years at the event, guests can follow Hollywood’s Halloween Horror Nights Twitter (@HorrorNights) and retrieve a password to deliver to the Purge psychologist in exchange for a small prize ranging anywhere from a Purge baseball cap to a mini first-aid kit. 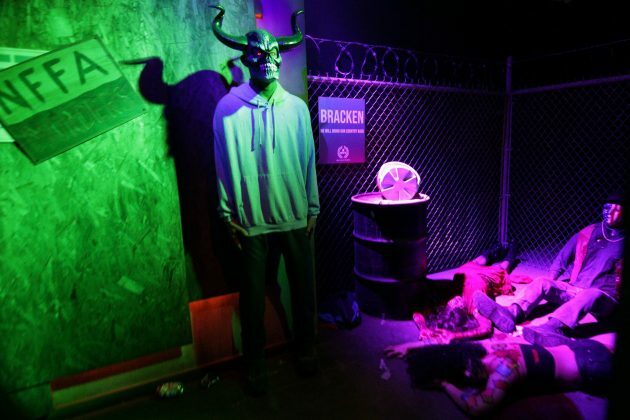 The First Purge maze takes guests through multiple scenes and locations featured in the movie as they fight to survive the night. 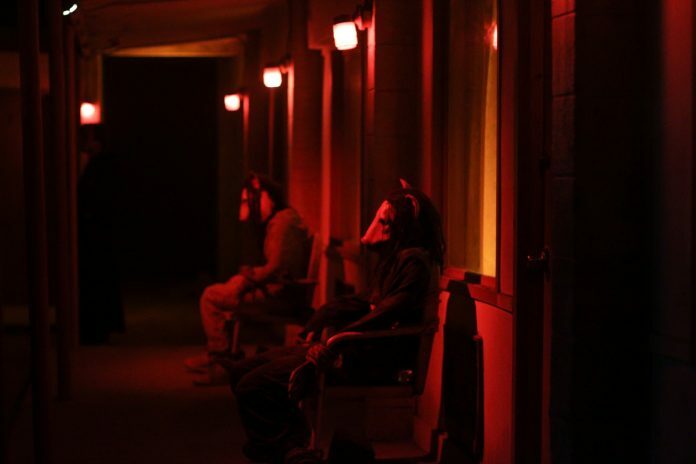 Of course, it would not be the Purge without characters sporting all sorts of exaggerated masks who lurk just around each corner. Bright neon colors compliment the urban setting of Staten Island as familiar sirens echo in the background, immersing guests in the energetic, yet sinister, world of the Purge. 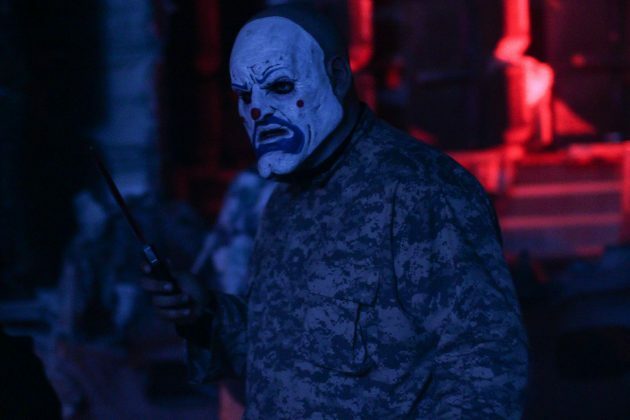 If not for the franchise having been overly-exhausted at Halloween Horror Nights, The First Purge maze would be a rather enjoyable walk-through. 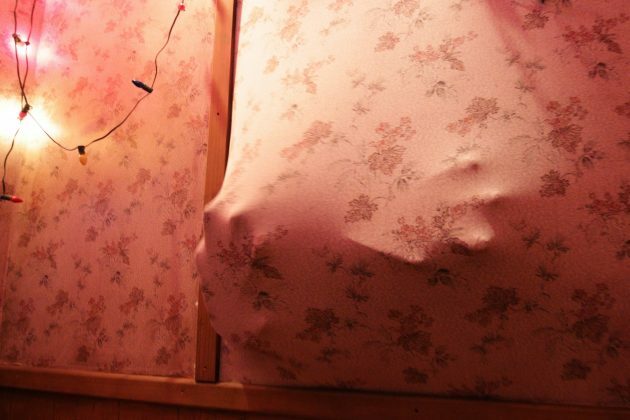 However, while scares may be plenty, there are not many memorable aspects of this maze. Surrounded by mazes far stronger than itself, The First Purge disappears among the lineup at the end of the day, though its energy still makes for an exciting experience while caught in the moment. 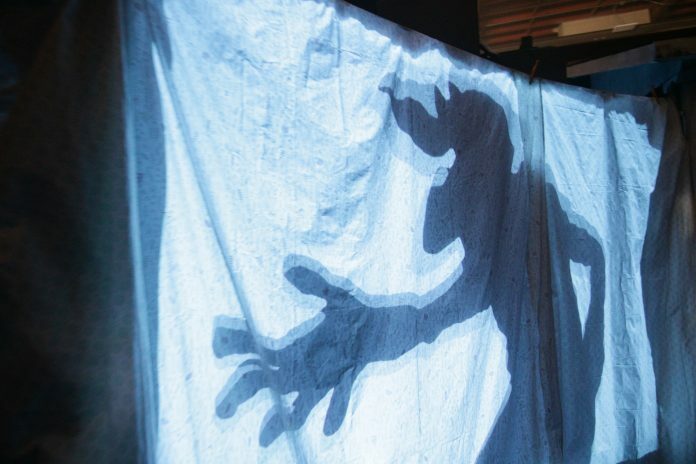 It’s here… the original Poltergeist film has finally made its way to Halloween Horror Nights. 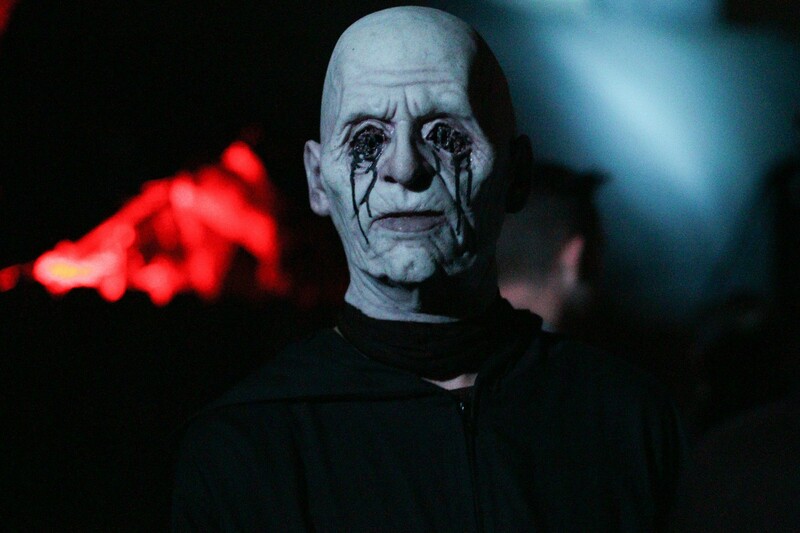 Following the paranormal events surrounding the Freeling family shortly after they moved into their new home, the maze features many of the iconic supernatural scenes and characters that have intrigued horror fans and frightened generations. Guests enter the Freeling home – a typical-looking suburban house unknowingly built atop a graveyard – as the tranquil main theme of the movie creates a deceptively-warm vibe. 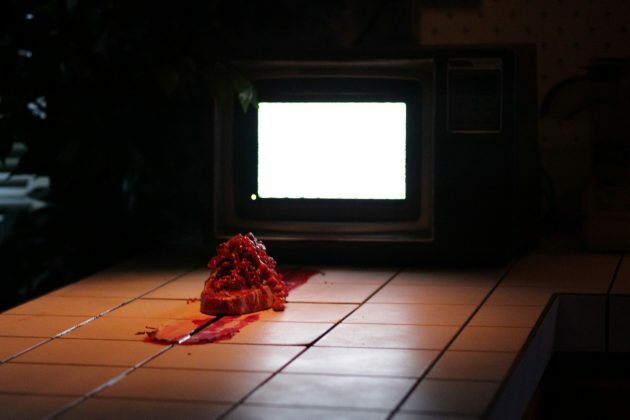 Similarly to the movie, the maze operates in a slow burn, first welcoming guests with the iconic scene of Carol Anne talking to the television set in the otherwise-peaceful living room of the family home. From then on, guests encounter many of the vengeful spirits haunting the Freelings as they travel from room to room. 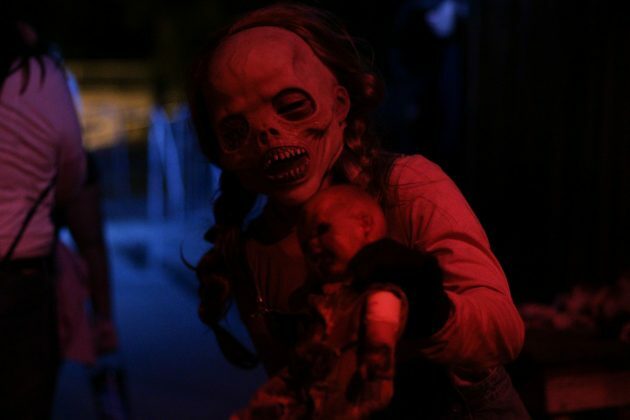 Poltergeist is undoubtedly one of the strongest mazes in this year’s lineup. 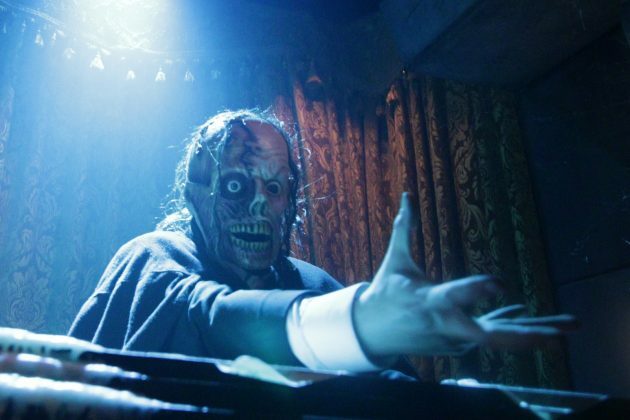 The movie’s iconic scenes successfully create a frightening and tense atmosphere that envelops guests in the plot of the movie as they themselves dodge the infamous ghouls at every turn. 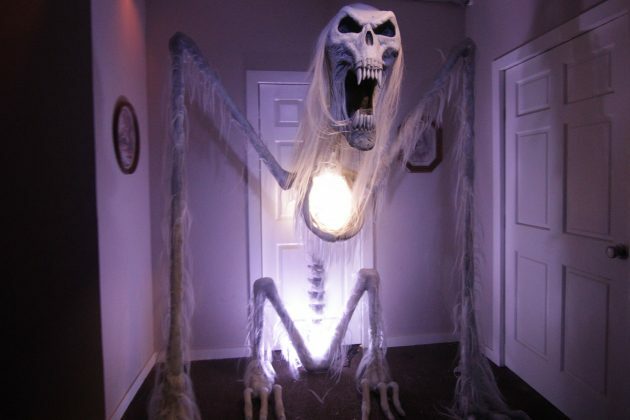 Whether you have seen the Poltergeist film or not, the maze will not fail to draw you “into the light” of it all. 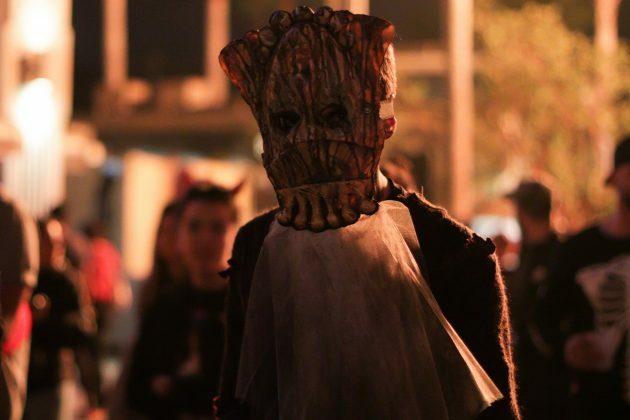 This year’s event features five scare zones – three in the Upper Lot, and two on the way to the metro sets on the Universal backlot. 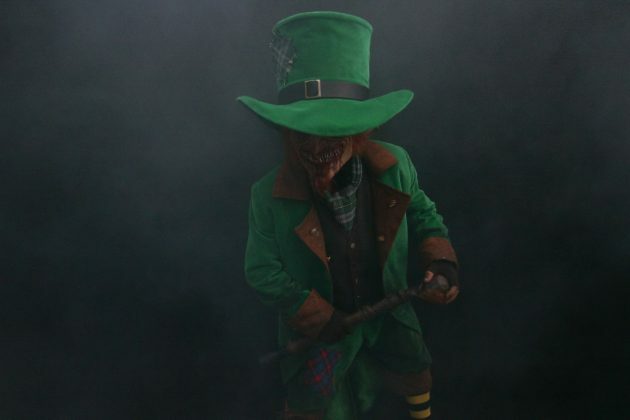 The first of the three scare zones in the Upper Lot was Hell’s Harvest, located on Universal Boulevard. 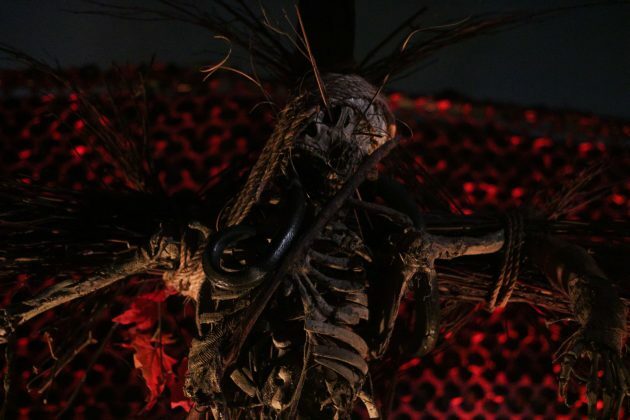 Serving almost as a bridge to the neighboring Trick r’ Treat scare zone, Hell’s Harvest takes guests through a pagan harvest festival – per the “harvest” in its title – where twisted, evil dolls brought to life roam the street in search of their next victims. Taking on a traditional Halloween theme of sorts, the props, decorations, and costumes are reminiscent of last year’s Hell-o-ween scare zone. However, repetition is not always a bad thing, and Hell’s Harvest does do a good job in chasing the spirit of Halloween right from where it all began. 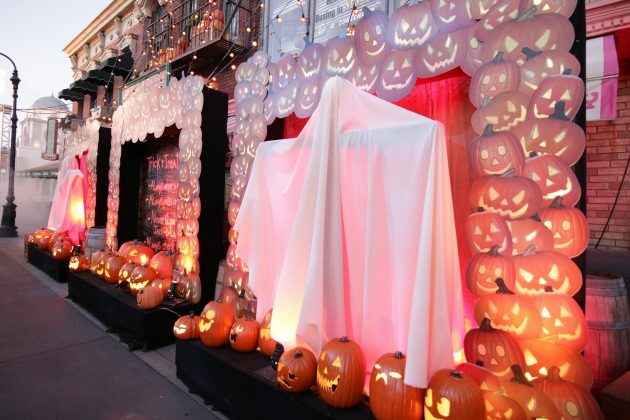 Beginning just at the end of Universal Boulevard and stretching up to the flame towers at the end of New York Street, Trick r’ Treat makes an additional appearance at the event in its respective scare zone. 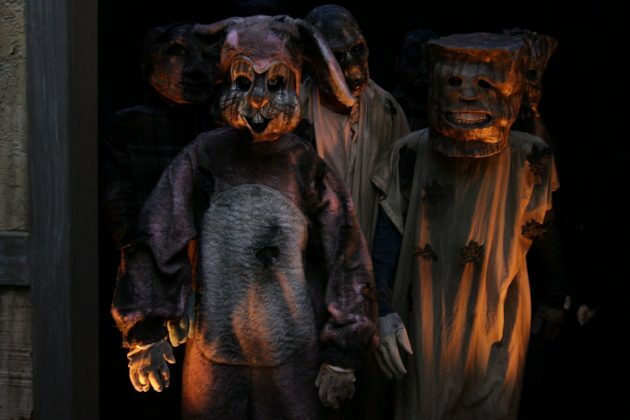 Featuring characters from the film including the zombie children from the School Bus Massacre, the werewolf girls, vampires, and Sam himself, Trick r’ Treat continues the traditional Halloween theme of the Hell’s Harvest scare zone. With this year’s event marking the return of the flame towers, an extra level of energy helps to bring this scare zone to life. While scares may be minimal, photo opportunities are plenty. 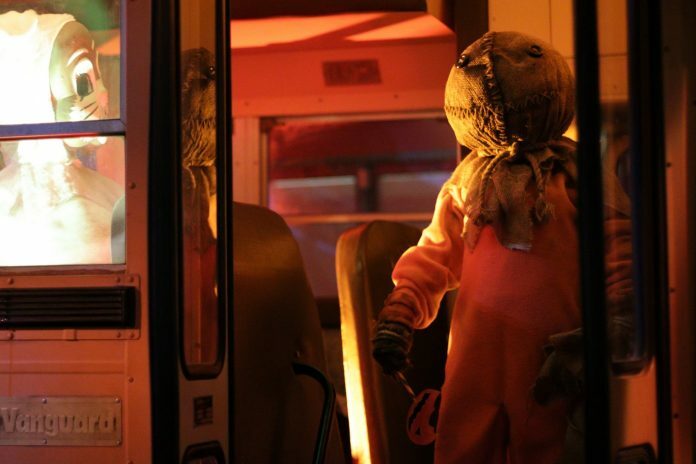 A school bus filled with the zombie children, as well as Sam, serves as the focal point next to an array of other Halloween decorations inspired by the film, including the rules of Halloween themselves. 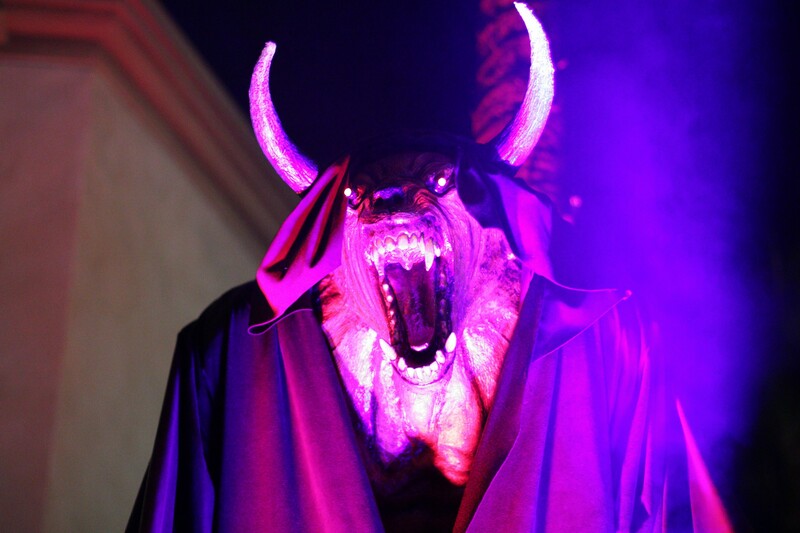 Monster Masquerade, the final scare zone located on the Upper Lot serves as a continuation of the Universal Monsters maze, stretching throughout most of French Street. 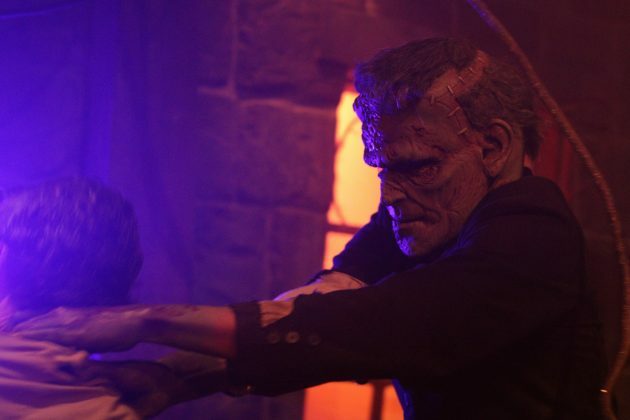 While unfortunate that guests can only access the scare zone after going through Universal Monsters, Monster Masquerade is easily one of the most visually-stunning scare zones of this year’s event with its bright colors and gorgeous costumes inspired by “The Phantom of the Opera” and “The Hunchback of Notre Dame” movies. 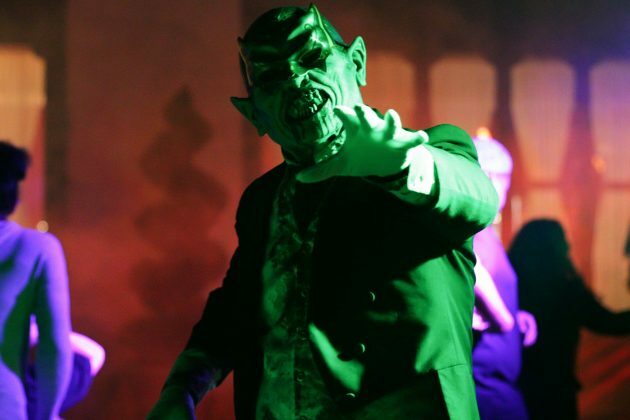 A handful of the Classic Universal Monsters roam the street in their masquerade attire, making for an enjoyable experience as you make your way through the world of the Universal Monsters. Following an industrial accident inside a utility tunnel deep underground, toxic fumes were released into the air, morphing the trapped emergency workers into deformed, furious monsters. 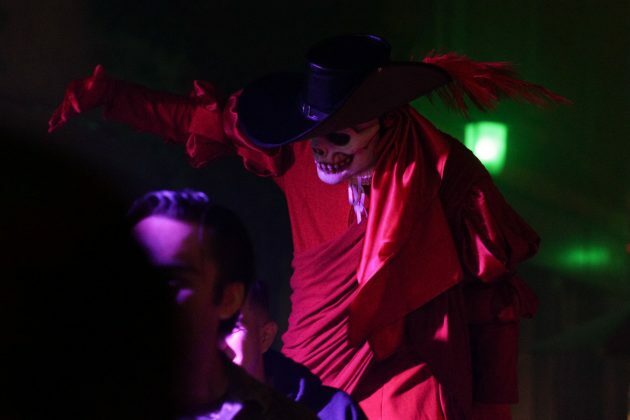 The Toxxic Tunnel has returned for its second year at Halloween Horror Nights, with the only remarkable difference being its slightly modified name. 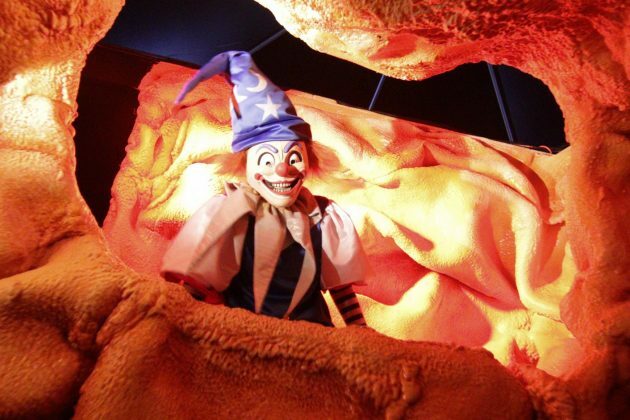 While scarce in props due to its tight, restricted location, the Toxxic Tunnel does its job in giving guests a few additional scares throughout a portion of their long walk to the Universal backlot. 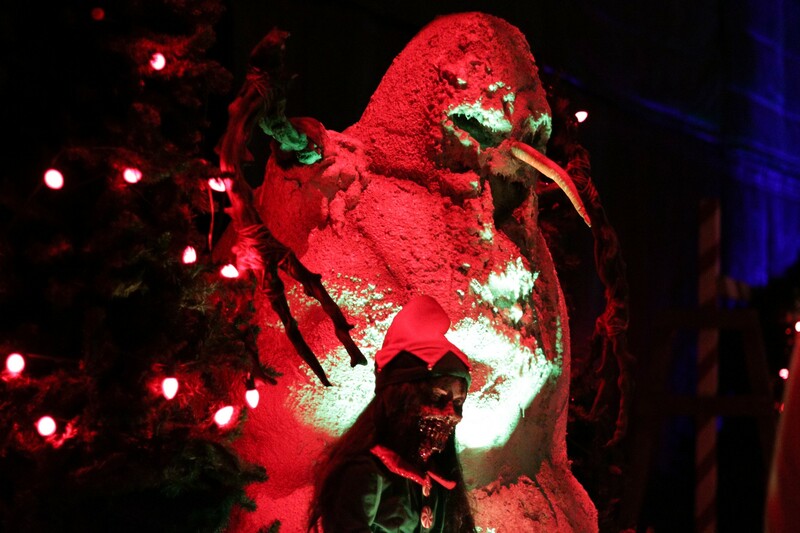 Taking a dark turn on the Holidays of the year, Holidayz in Hell gives guests the chance to encounter twisted renditions of popular Holiday icons, including terrifying turkeys, a distorted Uncle Sam, and even an appearance from the fan favorite, Krampus. 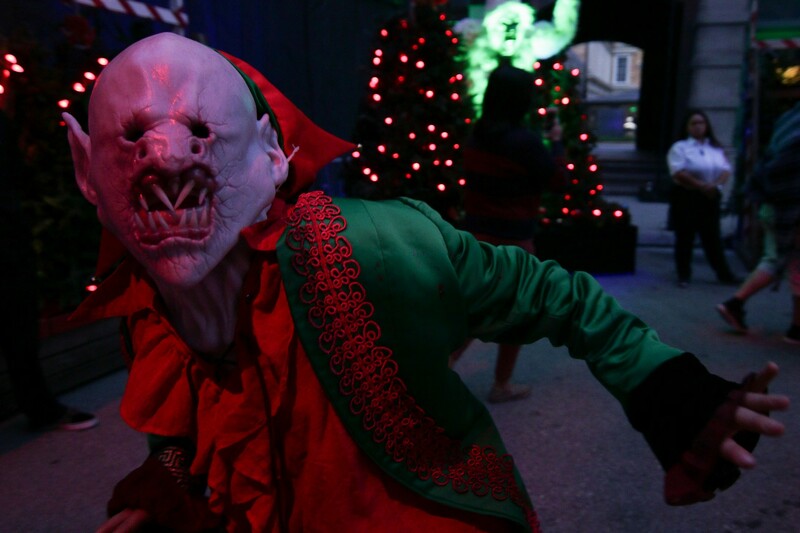 Continuing the trend initially set by the Dark Christmas scare zone from both 2014 and 2015’s event, Holidayz in Hell succeeds at creating an eerie atmosphere perfect for a mixture of scares and excitement just before approaching the backlot mazes. 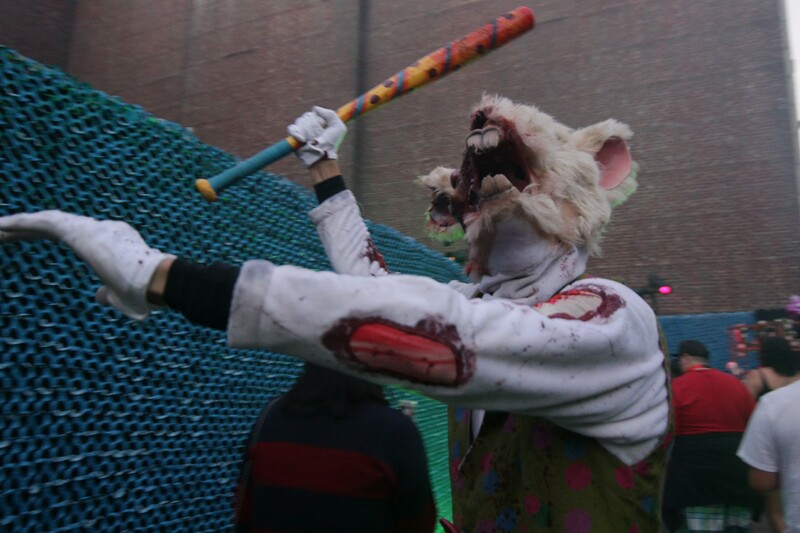 While the location of this scare zone generally makes for a very tight and compact surrounding amid the crowds, Holidayz in Hell feels surprisingly longer than the predecessors ever have. The mixture of its entertaining cheesiness paired with a strong scare factor easily makes Holidayz in Hell one of the stronger, if not the strongest, scare zone at this year’s event. 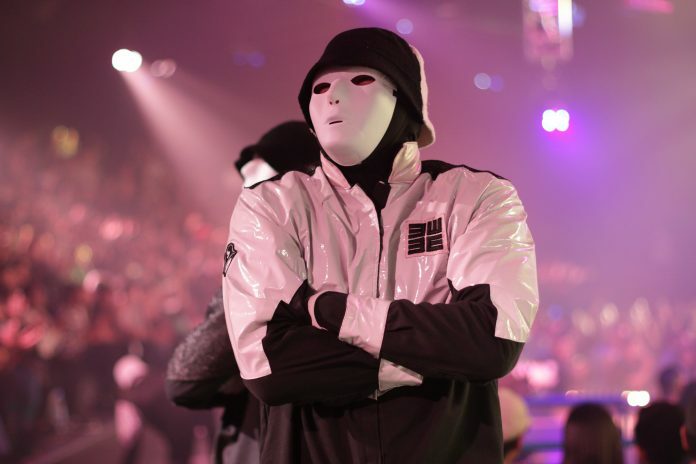 Back for their fourth year as the sole show featured at this event, the Jabbawockeez have made their return with an all-new performance. 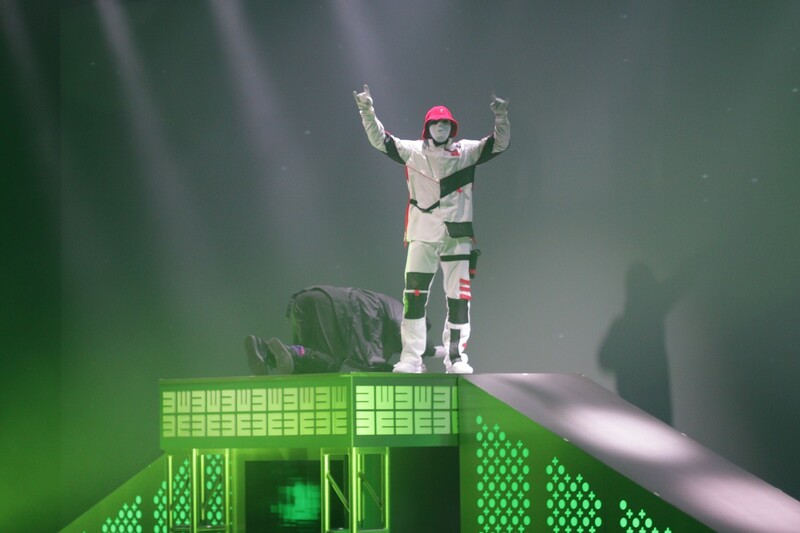 Focusing on the theme of technology in this year’s storyline, the Jabbawockeez dance crew fights to save the planet from its addiction to the internet and social media. Filled with energy and enthusiasm, this year’s show is nothing short of entertaining. 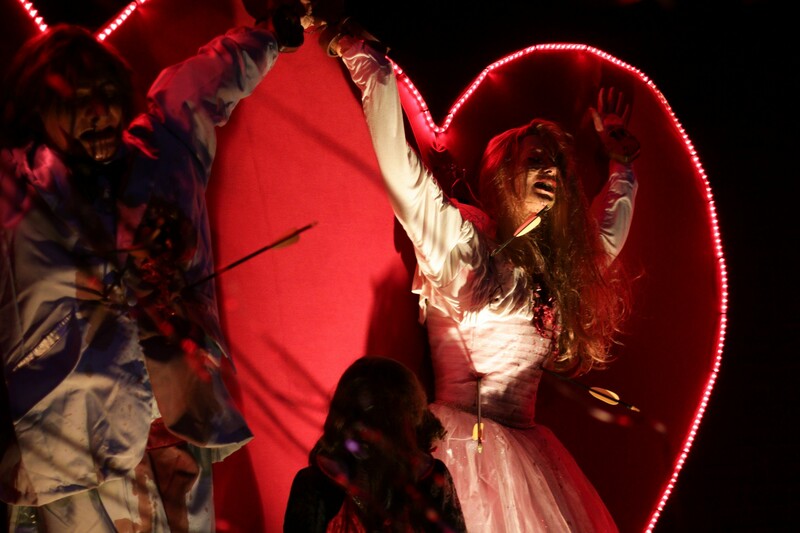 Between its use of pyrotechnics and an eye-catching light display, the performance flows well, capturing the attention of all audience members. 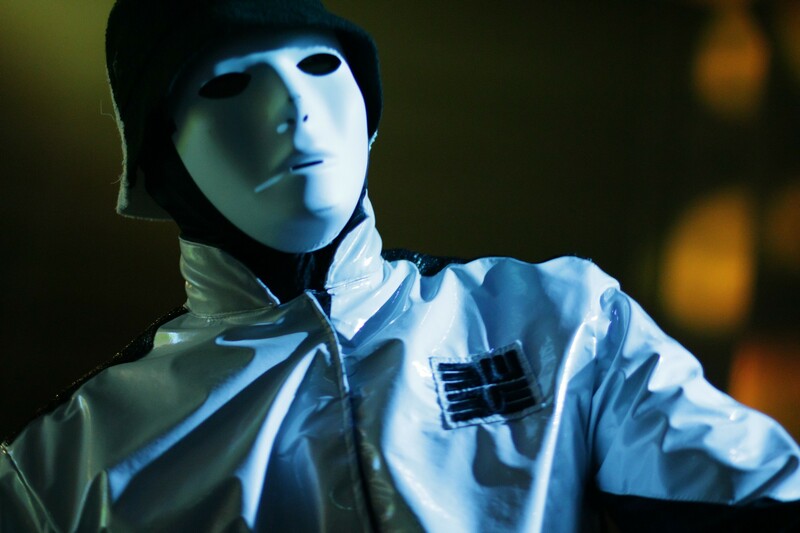 Whether you have seen one (or more) of the previous Jabbawockeez shows at the event, we recommend you still carve some time out of your night this year to stop by and watch a show. This year’s Halloween Horror Nights runs now through November 3 on select nights. 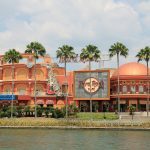 Be sure to follow Inside Universal here and on social media for continuing coverage of Halloween Horror Nights and Universal Parks and Resorts.